As the need to ‘go digital’ grows ever stronger, more of us increasingly wonder what this means. Is it just about the new tech that keeps turning up? Such as enterprise software, now sliced and diced into bite sized apps for our work tablets? Maybe that recent training you attended on “Digital Leaders as Innovators” is also part of the same thread? Can it be co-incidence that your CMO has suddenly started tweeting? And that she is now encouraging everyone to become ‘social brand ambassadors’? It can be tough to get a real sense of where all this is leading as our organisations piece together their digital game-plans. Often failing in the process to provide sufficient context and clarifying vision for those it is trying to coerce into change. Of course, it would be nice to think that things might settle down again once we arrive at this digital destination. But I doubt it. The journey we are all on is not so much an early evening stroll along the seafront. It’s more akin to a proper hike over distance. One that makes you feel you have left behind a familiar place and arrived somewhere completely new. The heritage of the organisations we still feel comfortable in (if often frustrated by) was born during the great upheaval of the Industrial Revolution. While the ink on that blueprint has long since dried, we have continued to engage with the model. Tweaking it and honing it. In fact many enterprise careers have been spent optimising this model with ongoing rounds of business cases and promised ROIs. But we are now in a new cycle. We are at the early stages of building new foundations rather than squeezing the pip of what’s already there. This is a different skill. How can you predict an ROI on something yet to be understood? My hunch is that the impact of digital puts us all into a state of perpetual beta. We never arrive. It is the nature of digital that things keep morphing. And will do so at a speed we are yet to become accustomed to. Imagine the contrast of doing business between the 1920s and the 2020s. Most noticeable would be the pace of life. If we ever thought digitalisation was going to going to make our lives any easier, few now believe it. As things keep speeding up, time gets more compressed as we work faster to keep up. Maybe at some point our metabolisms will reset as we acclimatise to these new digital rhythms. Is this how ‘digital natives’ already experience it? Part of the legacy we are trying to leave behind is siloed behaviour. While functional specialism has provided a stable way of managing organisations, it has also encouraged tribalism and fragmented approaches to corporate ambitions. In the world of customer engagement this is as old as the joke about Marketing never failing to drop campaigns on the busiest service days. In fact why do they do that? The answer is drop dead simple. Apart from executives’ horizons, employees tend not to experience working for the brand they joined. Instead they serve the ambitions of their functional team. In truth it’s their boss’s agenda that matters most to their career. This is why a sales team can win while a marketing team can fall short. It’s why manufacturing can achieve its output target yet a service team fails to stay in budget dealing with an unexpected spike of complaints from the latest product launch. Without alignment, the dots never get joined. While everyone knows it’s smarter to keep customers, I’ve yet to meet a retention director. Functional motivation makes fools of us all. Internal corporate agendas are filled with stories of what ‘they’ did to ‘us’. Are the people behind those stories undermining and uncaring? Maybe a few are. But most act as they are directed through the combined magnetic pull of targets, incentives and parochial team agendas. Even though we might understand this behaviour, we cannot continue to excuse such ‘unconscious incompetence’ in today’s digital climate. More aligned competitors and more demanding, knowledgeable customers are now catalysing a fundamental rethink on how our organisations need to function. Digital is making people smarter. 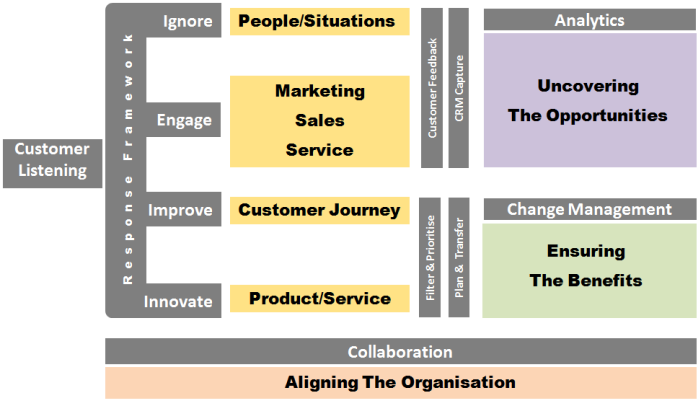 Anyone mapping customer journeys will tell you that the delta between their ‘as is’ and ‘future state’ versions is about transforming the hand offs between teams and the level of customer effort still being generated by the organisation. As far back as 1996, Harvard Business School professor John Kotter claimed that nearly 70 % of large-scale change programs didn’t meet their goals and virtually every survey since has shown similar results. It’s all down to botched execution. As change guru Gary Hamel put it so well in 2014 McKinsey article, what we really need are ‘change platforms’ not more ‘change programmes’. With all this evidence being surfaced, it’s not surprising that new approaches are being urgently sought. A big clue lies in the way we are organised and work together. For instance the current debate around whether CMO and CIO roles ought to converge given the cross-over of interests in each role is a case in point. We see a similar debate taking place in customer service between Service and Marketing functions over ownership and participation in social engagement. These are all symptoms of the underlying need to think and act differently as part of laying the new foundations to becoming a digital organisation. But whatever solutions are adopted for these particular issues, one thing is clear. They will need to be implemented using new behaviours rather than legacy approaches. Otherwise all we end up with will be more of the same! This means we must avoid the temptation of going for big bang, top down initiatives which bet the house on a single idea working. Had this been a reliable and effective approach to corporate transformation, we would not see so many employees instinctively hold back as they wait for the latest one to fade into obscurity like all the previous ones. The trick is to begin as you intend to continue. In others words ‘do social to be social’ or ‘be digital to do digital’. These new behaviours fit the mission. So encourage collaboration, be agile, become responsive to real time data as the ways in which you organise initiatives and catalyse transformation. Change is by definition experimental. Workable outcomes gradually emerge from trial and error. Innovation, and for that matter evolution, both tell us that the ‘next step’ only comes into view after much testing of the options. Optimisation can demand an ROI before investment. Innovation though requires other ways to control risk. I believe the current popularity for the behaviour represented by the word ‘agile’ shows we are moving more towards this more iterative approach. IT projects have always featured highly in the previously mentioned 70% failure category. This has motivated technical project teams to introduce the disciplines of testing, huddling and learning as a low risk way of achieving effective execution at speed. When done well, it’s proved a great way of keeping teams aligned. Whether the language of ‘agile’ even features in your own approach, the important thing is figuring out how to make progress when outcomes will typically remain unknown until discovered, using a methodology that organisations can afford to invest in. So how does all this apply to the world of customer service? Simply this. We do not have an exception card that allows us to escape the impact of digital. We must apply the same logic to our own transformation if we are to remain relevant. This is where the model of a customer hub comes in. It offers a low risk transition into truly aligned customer engagement that is fully responsive to the speed and ever changing evolution of digital behaviour. Would you like to spend two days creating your customer hub with Martin on 13/14th of April? Join us in London at the Social Customer Service Summit 2016. Tickets are available now.